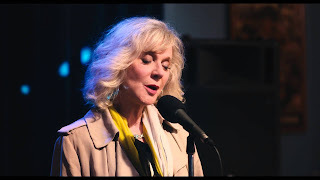 A low-key drama about love and death, I'll See You In My Dreams enjoys a heartfelt Blythe Danner performance but otherwise meanders in and out of cul-de-sacs. Carol Peterson (Danner) has been a widow for more than 20 years, and she enjoys an independent lifestyle close enough but not within a retirement community. Her dog Hazel is a close companion, as are her friends Georgina (June Squibb), Sally (Rhea Pearlman) and Rona (Mary Kay Place). When Hazel dies of old age, loneliness sets in, and Carol is further annoyed by an elusive rat that takes up residence in her apartment. Carol starts a tentative friendship with underachieving pool cleaner Lloyd (Martin Starr), a much younger man, and then she is asked out on a date by the rich, confident and masculine retiree Bill (Sam Elliott). A karaoke date with Lloyd reawakens her passion for music, while Bill wants to move quickly towards a serious relationship. With Carol wondering which way to steer her emotional life, daughter Katherine (Malin Åkerman) comes for a visit. An independent production directed and co-written by Brett Haley, I'll See You In My Dreams tackles themes of loneliness, love and death's looming shadow in the latter stages of life. The film maintains a soft and grounded tone, with Haley sprinkling touches of humour and wisdom in enough doses to keep the mood more light than overbearing. At 96 minutes the film is perfectly paced, with enough time for Carol's story to unfold without unnecessary moping. The death of Carol's dog Hazel is the trigger for reflection on what level of companionship she needs. Hazel and the small circle of friends had papered over the gaps caused by the death of her husband, but now Carol needs more, with pool boy Lloyd and the flamboyant Bill presenting contrasting alternatives. Lloyd is a young man already stuck in the neutral gear of life and a dead-end job, but he has the sensitivity to coax Carol back towards her singing passion. Meanwhile, cigar chomping Bill has a heart as big as Texas and confidence to match. He is all about living life to the fullest, spending lavishly, not having any regrets, and not wasting any time. The two men nourish Carol's soul in different ways, but events intervene and cause her to remember why she valued being alone: caring about others can be hard work, and the emotional investment comes at a price. She does not doubt the pleasure of companionship, but the pressure is also not to be discounted. Despite an absorbing performance from Blythe Danner, I'll See You In My Dreams peters out in its final third. Katherine's appearance is left hanging and the choice between the two men self-resolves. Carol becomes more of an observer and listener rather than a catalyst, and she defaults to an unimaginative level of comfort. While it's a pragmatic reality that mature people rarely embrace new risks, it's still vaguely disappointing that Carol doesn't more strongly advocate for girls just wanting to have fun, at any age.